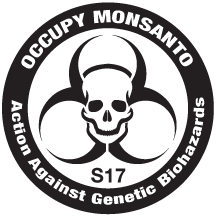 CCTV’s Jessica Stone reports on Adam Eidinger, an activist and Monsanto shareholder who wants the company to provide full disclosure of food made with genetically modified organisms (GMOs). Our work in agriculture represents just one component of a broad and diverse food value chain that involves many parties. The proponent is seeking a report about the impact of the company’s working with the Food and Drug Administration (FDA) to effect a change in labeling on consumer food products. 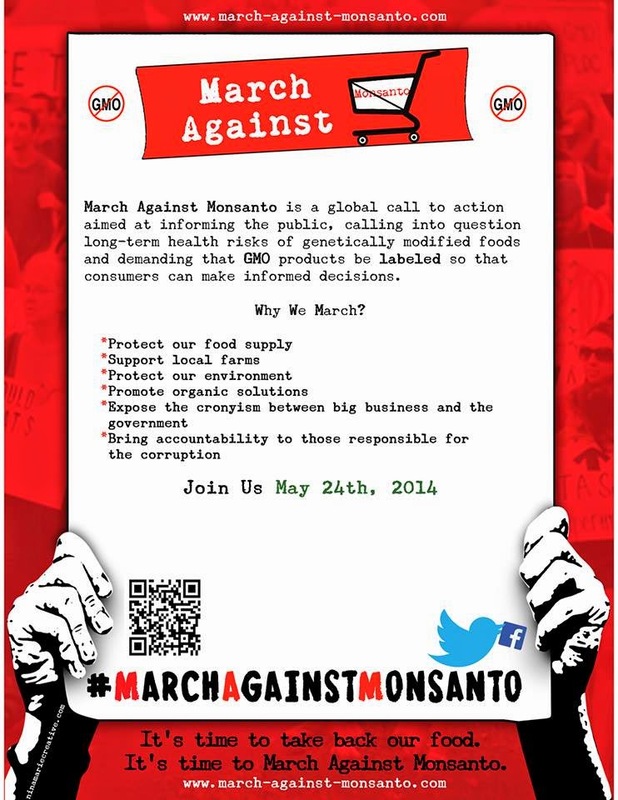 These are not Monsanto products nor are they manufactured, controlled, packaged or labeled by our company. We sell seed to farmers, who often sell their crop harvest to a grain processor, who sells grain or ingredients to a food company, who may further process the ingredients, then manufacture the food item, which it then sells to a retailer, who ultimately sells the finished product to a consumer. As a company that is focused on agricultural productivity and which sells products to farmers our position in the chain does not afford us the expertise that would inform an assessment of consumer food packaging information. Genetically modified (GM) crops are but one important tool that farmers may choose in engaging in sustainable agriculture. Farmers, whether they adopt conventional, GM or organic seeds, employ a variety of production practices to control weeds and pests and improve the yield of their crops. In order to reduce the need for topical controls or other practices, millions of farmers around the world choose to control weeds and pests, and protect their crops’ yield, through GM seeds, which incorporate a new gene in the seed, such as a protein from a bacterium that is commonly applied over the top of conventional and organic crops to control pests. We support current FDA guidance on food labeling which is based on the attributes of the food itself. In the United States, the FDA regulates the safety and labeling of foods and food products derived from crops (conventional, GM, and organic), and all must meet the same safety requirements. FDA guidance requires labeling of food products containing ingredients derived from GM crops if there is a meaningful difference in composition, nutrition or safety between that food and its counterpart derived from conventional crops. In the absence of such a difference, the FDA has determined that mandatory labeling is not required. The American Medical Association (AMA) supports the FDA’s approach and approved a formal statement asserting that there is no scientific justification for special labeling of foods containing GM ingredients. FDA guidance does not require labeling of production practices used by farmers employing conventional or organic methods to control weeds and pests and improve their yields. 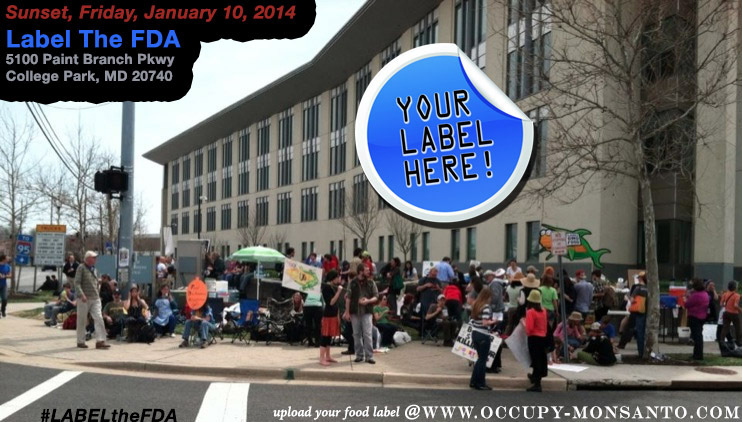 We support voluntary labeling to support consumer choice, provided the label is truthful and not misleading. We recognize that some consumers may prefer to avoid foods that contain GM ingredients. Food companies recognize this as well, and are providing these customers the choices they prefer through organic offerings or by voluntarily labeling their products “non-GM”. People who prefer to purchase non-GM foods can easily find such products. The FDA allows food manufacturers to label their products voluntarily to indicate certain attributes or production methods (e.g., organic, conventional or GM), provided the label is truthful and not misleading. We support this approach and are pleased to sell our seed products to farmers employing any of these production methods. For more information about our views on consumer choice and proposals that would mandate labeling of food products containing GM ingredients, please visit http://www.monsanto.com/newsviews/Pages/food-labeling.aspx. We believe that mandatory labeling of GM ingredients where there is no meaningful difference in nutrition or safety could confuse and mislead consumers. Demands for mandatory labeling of GM ingredients as a matter of consumer choice may instead lead to a reduction in consumer choice by misleading consumers into thinking products bearing such a label are not safe, are less nutritious or are otherwise inferior to similar products without the label. Indeed, the pejorative connotation of a mandatory label could result in consumers viewing it as a warning statement that could scare them about the foods they have come to like and trust. The suggestion advanced in the proposal is that the company should advocate for the proponent’s preference for labeling consumer food products, which is contrary to the position we have stated publicly and contrary to the views of our customers and the food value chain. We support transparency and dialogue about biotechnology and our products, both with our customers and with consumers. In the United States, the Grocery Manufacturers Association, of which the company is a member, recognizes that some consumers may have questions about GM production methods and food ingredients and is providing information through a dedicated website, http://factsaboutgmos.org/. This site informs readers that if the ingredient label on a food or beverage in the U.S. indicates that the product contains corn or soy, the product most likely contains ingredients derived from GM seeds because a very high percentage of corn and soy in the United States is grown from GM seed products. In addition, www.monsanto.com, provides extensive information about biotechnology benefits and safety, generally, and Monsanto’s genetically modified seed products, specifically. Recently, Monsanto has worked with other seed companies to make additional information about agricultural biotechnology available to interested consumers. The website GMOanswers (http://www.gmoanswers.com) invites consumers to ask questions about agricultural biotechnology. 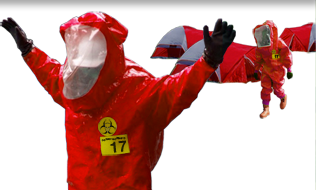 General safety and benefits questions are addressed by independent experts; company-specific questions are addressed by company representatives. Assessing the inclusion of U.S. patent numbers related to biotechnology on American food labels is unrelated to our business and such labeling would likely be disruptive to the food supply chain. The consumer food product labels that the proposal suggests analyzing are unrelated to our business of selling seed products to farmers. The proposed assessment would provide no meaningful information to shareowners. The proposal appears to suggest that the inclusion of patent numbers on product labels might serve as indicia that a product contains ingredients derived from GM seeds. The food manufacturer would then be burdened with significant compliance challenges if required to specifically identify the variety of seeds that produced grain that was ultimately processed in the food. Given the extensive pre-commercial food safety assessment and regulatory reviews by government officials, the U.S. food system operates effectively and efficiently in managing commodity crops, such as corn, soy and cotton. A separate program would be required to harvest, crush, store, transport and process by particular seed varieties, in order to enable labeling to that level of specificity, and would undermine the system. Currently, the USDA is reviewing GMO crops designed to withstand 2,4-D and Dicamba. 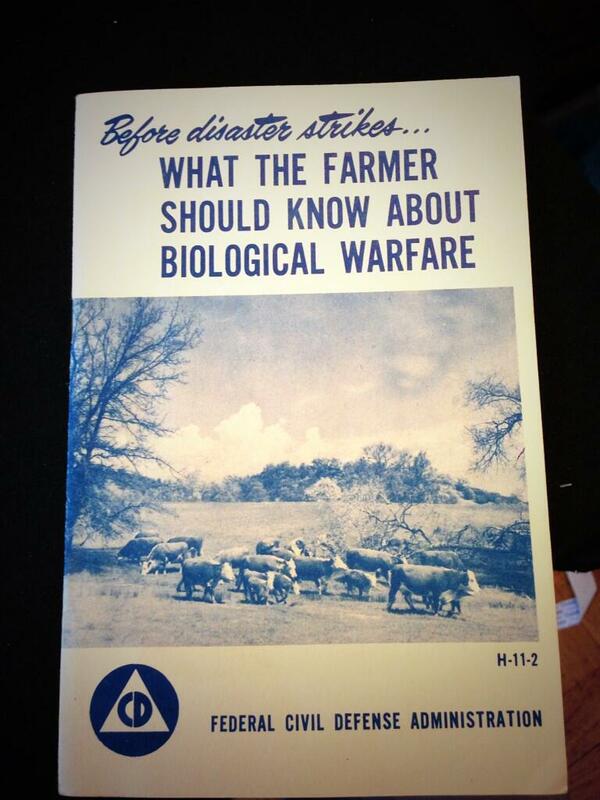 However, 50 years ago 2,4-D, otherwise known as 2,4-Dichlorophenoxyacetic Acid, was considered a agent of biological warfare that could kill farmers crops. Agent Orange, used by the U.S. military as part of its herbicidal warfare program, Operation Ranch Hand, during the Vietnam War from 1961 to 1971, caused thousands of birth defects. Agent Orange is half 2,4-D and half 2,4,5-T, which means these GMO crops are very toxic to humans and the environment. Worse, if approved, these toxic GMOs wouldn’t be required to be labeled. 1. Destructive dusts from airplanes carrying chemical plant growth inhibitors, such as 2,4-D or 2,4,5-T.
2. Large scale aerial dissemination of disease-producing spores. 3. 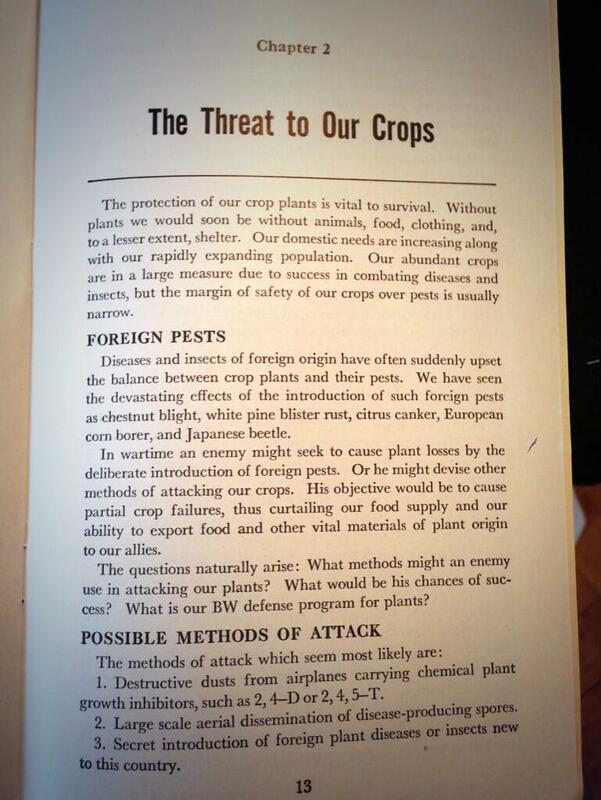 Secret introduction of foreign plant diseases or insects new to this country.